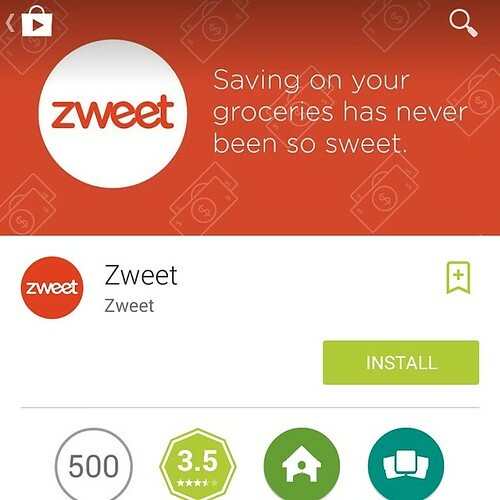 The Zweet money saving app is now available for Android devices. I have been using it on my Ipad for awhile now and really like it. As you know there are quite a few money saving apps out now. Every little bit helps these days with our ever rising grocery costs. I find the easiest way to use these rebate apps is to sit down when I get home from grocery shopping(who doesn't need to sit down after that!?) and quickly scan my receipts for any qualifying purchases. The things I like about Zweet are that they usually always include fresh produce in their rebates, and they don't sell out like the Checkout 51 and Snap Saves ones do(at least not yet). I have been a member of Zweet since April and haven't yet cashed out. Cash out is at $20. I am at $14.25. Checkout 51 I have cashed out $85.75 so far this year. That's a total of $133.00 in cash rebates on groceries I was buying anyways! No coupons required! But, if you use them you can double your savings! Do you use these apps?